Reduced price ticket: 2,50€ (over 65; university students; 6-12 years old visitors; disabled people; groups of minimum 20 participants). Fb page: Area archeologica e Museo del Tesoro di S.Eulalia. 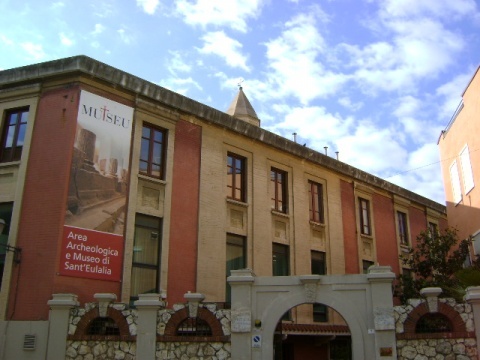 The museum shows the history of the Parish of St. Eulalia, one of the most traditional in Cagliari and in Marina district, where it is located. In its exhibition halls houses a wide collection of wooden paintings, silverware, vestments and a historical archive. Among the paintings we report the "Ecce Homo" (double-sided oil on canvas), depicting Jesus scourged, attributed to John Bilevelt, a painter of Flemish origin of the first half of the 17th century. Remarkable, also, the Madonna with Child, a 14th century table of Tuscan school. Among the wooden works, as well as artefacts of 18th century Sardinian anonymous carvers and Neapolitan workshops, deserves to be mentioned "Our Lady of the Forsaken" (last decades of the '500). The hall of silver gathers lamps, crosses, chalices, monstrance and ciborium commissioned by the Congregation of the Blessed Sacrament, some in baroque style from Liguria and Piedmont, while others produced in Sardinian workshops. Rare vestments, belonged to popes and archbishops, are shown in apposite display cases and cabinets. Donated by noble families and congregations, they are rich in symbolism and references to sacred history and coats of arms. Noteworthy is "The Planet of Passion", date back to the middle of the '600 and attributable to some embroiders from Liguria, describing Jesus in two moments: in prayer in the Garden of Gethsemane and into the Praetorium. The archive consists of the parish documentation and funds from the arch-confraternities of Holy Sacrament of the Holy Sepulchre and St. Lucia. It preserves scrolls, books, records and papers, dating from the first half of the 500 until the first decades of the 900, which testify the work of churches and congregations in the religious, economic and social field, and their relations with the inhabitants of Marina district. From the museum it's possible to reach underground archaeological area can be visited with the same ticket.